Working in many different fields of business activity, the ConceptDraw DIAGRAM users make any wanted drawings they need, including those involved in the quality management activities. Working for such sphere of business activity as quality management, people have to ensure that the organization they work for, as well as the product or service they provide, is consistent. To succeed in their job, they try to make sure they work in order to perform in four different components of quality management, such as quality planning, quality control, quality improvement and quality assurance. Quality management is known to be focused on the means in order to achieve the goal of providing the good quality products and/or services, apart from being focused on the service or/and product quality as it is. Using control of processes and quality assurance as well as products to achieve more consistent quality, the quality management is known to be one of the most popular spheres of the business activity. The main principle of the quality management is to guide the organization towards the improved performance. The top managers are usually in charge for such activity. Usually the top managers are in charge for achieving such goals as pleasing their customers as customer focus is basically the primary one for such organizations. Once the customers’ requirements are met and the customers’ expectations are exceeded, then it means that the main objective of the quality management of some particular organization is achieved. Attracting and retaining the confidence of its customers seems to be the most important thing to succeed in for all the managers within some particular company. If also the other interested parties on whom the achievement depends are pleased, then it is even better. Every single aspect of the customer interaction is expected to be provided by an opportunity of creating more value for those customers. The understanding of both current as well as future needs of all the customers and the other interested parties is expected to be contributed to the sustained success of any particular organization, mainly – by the leaders of the organization at all levels, who are meant to be establishing the unity of purpose as well as the direction, creating the special conditions for people to become engaged in achieving the company’s quality objectives. The unity of purpose is as much important as engagement and the direction of the people who enable some organization to align its policies, strategies, resources and processes in order to achieve all its objectives. Engagement of people is also a very important constituent of any manager's work within any organization. Empowered, engaged and competent people are essential to enhance the company’s capability at all levels throughout the organization in order to deliver the value once it is created. In order to manage an organization in both an effective as well as an efficient way, it is always important to involve the right people at all levels. It is also very important to respect them all as individuals ensuring their engagement in achieving the organization’s quality objectives in this way. Thus, recognition, empowerment and enhancement of competence can facilitate such things. Predictable and consistent results are those which are simpler to achieve in more efficient as well as an effective way once the activities are well understood and well managed. Consisting of the interrelated processes, the quality management system is the one used for simplifying the understanding of in what way the results are produced by this mentioned system, enabling an organization to optimize its performance. All the successful organizations have their main focus on improvement as it is essential for any organization to enable it to maintain the current levels of performance and to react to all the changes in its external and internal conditions, creating the new opportunities. All the decisions based on the evaluation and the analysis of data as well as information are always more likely to produce the desired results. That is why all the decision-making processes are so complex: they have to be all well planned before they are brought to life. A quality management system is simply a collection of different business processes which is focused on the achieving one important goal — to meet the customers’ requirements as well as to enhance their satisfaction, being aligned with the organization's strategic direction and its purpose. The described system is the one being expressed as the organizational aspirations, policies, goals, processes, resources and documented information are all needed to be implemented and maintained. The organizations are expected to be seeking certification or compliance for defining the processes which are known to be forming the quality management system as well as the interaction and the sequence of such processes. There are a few books can be found which provide different “step-by-step” guides for those who seek the quality certifications of their products. The examples of the described processes include the order processes, the production plans, the product/ service/ process measurements for complying with the specific requirements, such as the measurement systems analysis and the statistical process control, calibrations, internal audits, corrective actions, preventive actions, identification, labelling and control of the so-called “non-conforming products” for preventing its delivery, inadvertent use or processing. Pic.1 Business process TQM diagram. 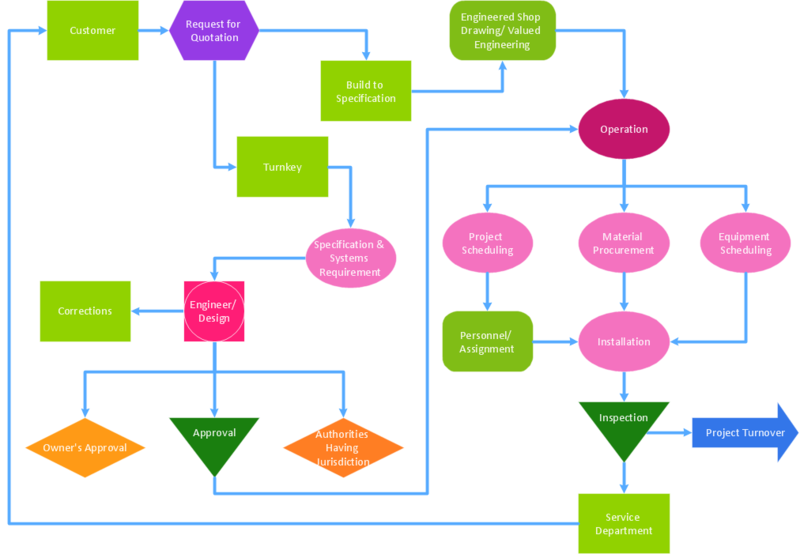 Having ConceptDraw DIAGRAM diagramming and drawing software you can always mentioned the described processes in a way of a professionally created flowcharts, charts, schemes, plans and maps. Total Quality Management diagrams can be simply made in ConceptDraw DIAGRAM within only a short period of time as long as you use the right solution for such purpose. Each business is created, exists and develops according to its type of business structure. Creating new business or developing existing, you may need a powerful software for representing its business structure. In this case ConceptDraw DIAGRAM v12 diagramming and vector drawing software extended with 25 Typical Orgcharts solution from the Management area is exactly what you need.